This article is about the means of cable transport. For other uses, see Gondola (disambiguation). A gondola lift is a means of cable transport and type of aerial lift which is supported and propelled by cables from above. It consists of a loop of steel cable that is strung between two stations, sometimes over intermediate supporting towers. The cable is driven by a bullwheel in a terminal, which is typically connected to an engine or electric motor. They are often considered continuous systems since they feature a haul rope which continuously moves and circulates around two terminal stations. Depending on the combination of cables used for support and/or haulage and the type of grip (detachable grip vs. fixed grip), the capacity, cost, and functionality of a gondola lift will differ dramatically. Because of the proliferation of such systems in the Alpine regions of Europe, the French language name of Télécabine is also used in an English language context. Classic 1960s 4-seater monocable gondola lift in Emmetten, Switzerland, built by GMD Mueller. This lift was of the same type as the old Whistler, British Columbia gondola. Interior of a gondola lift station, in this case an intermediate station where gondolas detach from the line, automatically travel through the building on tracks and attach to the line of the second section. The drive motors for both sections are visible below the bullwheels. Gondola lifts should not be confused with aerial tramways as the latter solely operates with fixed grips and simply shuttles back and forth between two end terminals. Both are types of cable car. In some systems the passenger cabins, which can hold between two and fifteen people, are connected to the cable by means of spring-loaded grips. These grips allow the cabin to be detached from the moving cable and slowed down in the terminals, to allow passengers to board and disembark. Doors are almost always automatic and controlled by a lever on the roof or on the undercarriage that is pushed up or down. Cabins are driven through the terminals either by rotating tires, or by a chain system. To be accelerated to and decelerated from line speed, cabins are driven along by progressively swifter (or slower) rotating tires until they reach line or terminal speed. On older installations, gondolas are accelerated manually by an operator. Gondola lifts can have intermediate stops that allow for uploading and downloading on the lift. Examples of a lift with three stops instead of the standard two are the Village Gondola and the Excalibur Gondolas at Whistler Blackcomb. In other systems the cable is slowed down intermittently to allow passengers to disembark and embark the cabins at stations, and to allow people in the cars along the route to take photographs, such as Lebanon's Téléférique which offers an exceptional view to the Mediterranean, the historical Jounieh Bay and the pine forest at the 80% slope which this gondola lift goes over. Such a system is called Pulse Cabin because usually more than one cabin are loaded at a time before the trip begins. Systems where a single cable provides both support and propulsion of the cabins are called monocable gondolas. 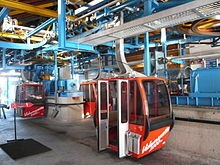 Another type of gondola lift is the bi-cable gondola, which has one other stationary cable, besides the main haul rope, that helps support the cabins. Famous examples of this type of lift include the Ngong Ping Cable Car in Hong Kong, the Singapore Cable Car, and the Sulphur Mountain Gondola in Banff, Canada. This system has the advantage that the stationary cable's strength and properties can be tailored to each span, which reduces costs. 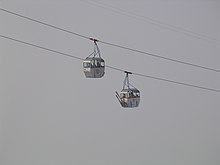 There are also tri-cable gondolas that have two stationary cables that support the cabins. They differ from aerial tramways in that the latter consist only of one or two usually larger cabins, moving up and down, not circulating. Bi- and tri-cable systems provide greater lateral stability allowing the system to operate in higher cross-winds. Open-air gondolas, or cabriolet as commonly called, are fairly uncommon and are quite primitive because they are exposed to the elements. Their cabins are usually hollow cylinder, open from chest height up, with a floor and a cover on the top. They are usually used as village gondolas and for short distances. An example of these are the Cabriolets at Mont Tremblant Resort in Quebec, Canada, and at Blue Mountain Ski Resort (summer only, in the winter it is converted to a six person high-speed chairlift.) in Ontario, Canada, The Canyons Resort in Park City, Utah, Mountain Creek, and the new Village Cabriolet at Winter Park Resort in Colorado. Open-air gondolas can also come in a style similar to a pulse gondola, like the Village Gondola at Panorama Ski Resort, British Columbia. The first gondola built in the United States for a ski resort was located at the Wildcat Mountain Ski Area. It was a two-person gondola built in 1957 and serviced skiers until 1999. The lift was later demolished in 2004. The lift and its cabins were manufactured by a former Italian lift company: Carlevaro-Savio. One of the longest gondola rides in the world, Gondelbahn Grindelwald-Männlichen, is in the Bernese Oberland in Switzerland and connects Grindelwald with Männlichen. A ropeway conveyor or material ropeway is essentially a subtype of gondola lift, from which containers for goods rather than passenger cars are suspended. Ropeway conveyors are typically found around large mining concerns, and can be of considerable length. The COMILOG Cableway, which ran from Moanda in Gabon to Mbinda in the Republic of the Congo, was over 75 km in length. The Norsjö cable car in Sweden had a length of 96 km. In Eritrea, the Italians built the Asmara-Massawa Cableway in 1936, which was 75 km long. Conveyors can be powered by a wide variety of forms of power sources: electric motors, internal combustion engines, steam engines, or gravity. Gravity is particularly common in mountainous mining concerns, and directly employed; the weight of loaded down-going containers pulling the returning empties back up the slope. Gravity can also be used indirectly, where running water is available; a waterwheel is powered by gravity acting on water, and is used to power the cable. While gondola lifts are traditionally used for ski resort purposes, in recent years they are finding increased usage in urban environments. Cable cars used for urban transit include the Metrocable in Medellín, Colombia; Portland Aerial Tram in Portland, Oregon, United States; Metrocable in Caracas, Venezuela; Trolcable in Mérida, Venezuela; Cable Aéreo in Manizales, Colombia; Mi Teleférico in La Paz, Bolivia; Mexicable in the State of Mexico, Mexico; Yenimahalle-Şentepe teleferik in Ankara, Turkey; the Emirates Air Line in London, UK. and the TransMiCable in Bogotá, Colombia, due to open at the end of 2018. The Metrocable systems in Medellin and Caracas are fully integrated with the public transit network which provides passengers the ability to seamlessly transfer to the local metro lines. In terms of urban gondola systems for the future, TransLink in Metro Vancouver has proposed to build a gondola up Burnaby Mountain to Simon Fraser University in an announcement in September, 2010. The project was sidelined in 2014, but was revived in 2017. In late 2012, a widespread aerial gondola system was proposed for Austin, Texas in an effort to expand mass transit options in the rapidly growing city. The proposal was rejected by the local transit agency in 2017. A proposed gondola system in Montreal was ultimately rejected by the Old Port of Montreal. Disney Skyliner is a gondola lift system which began construction in 2017 at Walt Disney World in Florida. When completed, the system will connect two theme parks with several Disney-operated hotels. The technical department of Bergen municipality, Norway suggested in 2016 to build a cable car. The proposed gondola lift was inspired by a similar project in Gothenburg, Sweden and was planned for the Western part of Bergen harbor. The National Ski Areas Association reports 0.138 fatalities per 100 million miles transported compared to 1.23 for cars. October 22, 1979: One person was killed and 17 other injured when two gondolas fell from the "Swiss Sky Ride" at the Texas State Fair. Winds gusting to 40 miles per hour caused three cars to collide and two fell on midway games below the cable. January 29, 1983: The Singapore Cable Car disaster, which saw seven people killed when two cabins plunged into the sea after the cableway was hit by a Panamanian-registered oil rig being towed. September 5, 2005: Nine people died and ten were injured when a 750 kg concrete block was accidentally dropped by a construction helicopter in Sölden, Austria. Hundreds had to be evacuated from the lift. July 13, 2006: Five people, including a three-year-old girl, were injured after two cable cars collided and one crashed to the ground. The accident took place at the Nevis Range, near Fort William in northwest Scotland. There were no fatalities and the gondola was deemed safe for operation shortly after the accident. February 18, 2007: A gondola car derailed from the cable at Ski Apache in New Mexico and rolled backwards hitting another car. Eight people were involved in the crash but only two suffered minor injuries. March 2, 2008: A man fell out of a gondola in Chamonix and died, perhaps after he and one of his friends leaned on and broke the plexiglass window. December 16, 2008: Ten people were injured (none seriously), and others left stranded after a tower supporting the Excalibur gondola lift on Blackcomb mountain collapsed, at the Whistler Blackcomb ski resort in Whistler, Canada. January 31, 2011: A ten-year-old boy fell 10–15 metres from a gondola in Hafjell, Norway. He suffered minor injuries. ^ "5 challenging cable car rides". Daisy Liu. 5 July 2012. Retrieved 2014-03-25. ^ "Detachable Gondola Lift | Products". 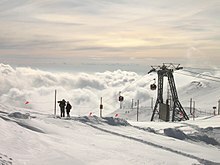 www.doppelmayr.com. Retrieved 2018-09-27. ^ "mdg / Monocable Detachable Gondola « The Gondola Project". gondolaproject.com. Retrieved 2018-09-27. ^ Ernst, Dr.-Ing. Richard (1989). Wörterbuch der Industriellen Technik (5th ed.). Wiesbaden: Oscar Brandstetter, 1989, p. 659. ISBN 3-87097-145-2. ^ "Aerial ropeways: automatic cargo transport for a bargain". ^ "The Emirates Air Line". ^ Dávila, JD (ed. ), 2013, Urban Mobility and Poverty: Lessons from Medellin and Soacha, Colombia, UCL and Universidad Nacional de Colombia. ^ "TransLink considers aerial gondola to SFU". The Vancouver Sun. September 22, 2010. Archived from the original on September 25, 2010. Retrieved 2010-09-22. ^ Roach, Melissa. "SFU gondola plans grounded". The Peak. Retrieved 26 February 2018. ^ Verenca, Tereza. "Is a gondola in the cards for Burnaby Mountain?". Burnaby Now. Glacier Community Media. Retrieved 26 February 2018. ^ "Gondolas in Austin: creative transportation ideas emerge". Austin Business Journal. November 14, 2012. Retrieved 2012-11-15. ^ "Proposal for urban gondola system in Austin will not move forward". KXAN.com. 2017-03-24. Retrieved 2018-02-26. ^ Burnett, Richard (11 December 2008). "Up in the air". Hour. Archived from the original on 12 August 2011. Retrieved 31 December 2008. ^ Byrd, David. "NSAA Ski Lift Safety Fact Sheet" (PDF). National Ski Areas Association. Retrieved 18 November 2015. ^ "Fair flashback: In 1979, a deadly day for the State Fair of Texas". Dallas Morning News. Dallas Morning News. 12 October 2011. Retrieved 4 October 2015. ^ "Nine killed in freak cable car crash". Sydney Morning Herald. September 6, 2005. Retrieved 2006-12-06. ^ "People injured in cable car crash". BBC News. July 13, 2006. Retrieved 2007-10-27. ^ "Man dies in Chamonix lift fall". ^ "Whistler gondola accident injures 10". Calgary Herald. December 17, 2008. Archived from the original on December 20, 2008. Retrieved 2008-12-17. ^ "Gondola accident Hafjell, Norway". Synnøve Åsebø. January 31, 2011. Retrieved 2011-01-31. ^ Greenfield, Patrick (30 July 2017). "Passengers rescued after cable car gondola crashes in Cologne". The Guardian.